With religious sentiment believed to still play a significant role in the nation’s politics, presidential hopeful Joko “Jokowi” Widodo — widely seen as a typical Javanese abangan, or nominal Muslim — has been working aggressively to garner support from the nation’s Muslim leaders. In his second attempt to woo Muslim voters, the Jakarta governor and Indonesian Democratic Party of Struggle (PDI-P) nominee, paid a visit to the Central Java city of Rembang on Thursday night, to meet with influential Nahdlatul Ulama (NU) cleric Mustofa Bisri, known as Gus Mus — but this time without any high-profile media coverage. It was reported that Jokowi left City Hall on Thursday at 3 p.m. and arrived in Rembang, located 600 kilometers east of the capital, several hours later. 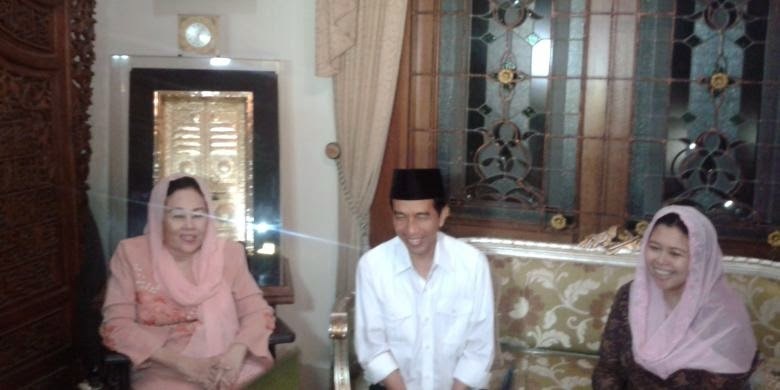 Jokowi, according to media reports, also visited PDI-P politician and Kudus regent Musthofa on his way back to Jakarta. Nusron Wahid, leader of the Ansor Youth Movement (GP Ansor), a youth wing of NU, who was present at Jokowi’s meeting with Gus Mus, considered the meeting a “regular gathering”. “They [Jokowi and Gus Mus] discussed many things, including the country’s religious affairs and how the government should handle them in the future,” said Nusron. As the chairman of NU’s religious council, Gus Mus is considered one of the organization’s most senior figures. The 69-year-old cleric is also known as a popular figure on Twitter with more than 300,000 followers. Earlier on Thursday, Jokowi visited the headquarters of Muhammadiyah, the country’s second-largest Muslim organization, in Central Jakarta, and led a dhuhur (midday) prayer gathering at the request of Muhammadiyah chairman Din Syamsuddin. Jokowi’s official schedule, however, mentioned nothing about his later meeting with Gus Mus. Jokowi, who returned to his office on Friday, refused to comment on his brief trip to Rembang. PDI-P secretary-general Tjahjo Kumolo said Jokowi’s visits to Muhammadiyah and NU should be seen as an effort to show respect to the organizations. “If the PDI-P and Pak Jokowi manage to secure the people’s mandate [to lead the country], NU and Muhammadiyah, along with other religious organizations, would become very important for the country in achieving its national goals,” Tjahjo said. Many surveys have suggested that Jokowi and the PDI-P will be victorious in the upcoming legislative and presidential elections. However, after receiving the official PDI-P presidential nomination earlier this month, Jokowi has only a few more weeks to consolidate support for his party ahead of the April 9 legislative election. Indonesian Institute of Sciences (LIPI) political science researcher Firman Noor said Jokowi’s visit to Gus Mus was necessary after NU chairman Said Aqil Siradj recently signaled his personal preference for the Muslim-based National Awakening Party (PKB) through his appearance in the party’s political advertisements. “Overall, Gus Mus is considered a ‘neutral’ NU figure who can help Jokowi earn recognition from NU supporters,” Firman told The Jakarta Post. Meanwhile, on Friday, leaders of political parties continued to woo supporters in different cities on the sixth day of the open campaign period. In Malang, East Java, PKB chairman Muhaimin Iskandar served as the party’s main campaigner, while National Mandate Party (PAN) chairman Hatta Rajasa took the lead for his party in Sumedang, West Java. In Depok, West Java, Golkar chairman Aburizal Bakrie told supporters he would introduce free 12-year education and direct funding to support village development.